Cardiff Bay’s instantly recognisable waterfront, with the deep red Pierhead Building surrounded by the curving lines and sharp angles of its more recent neighbours, is part of a diverse built environment which has constantly evolved over almost two centuries. Buildings across Butetown tell the story of this evolution: from the humble architecture of the Bute Dock Hotel to the grand high-Victorian Coal Exchange and the elegantly modern Senedd Building. 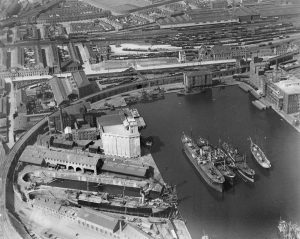 The northern end of Bute East Dock, now Atlantic Wharf, in 1921. 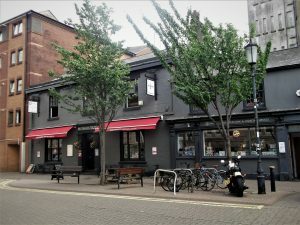 Before the nineteenth century Cardiff’s maritime industry operated from the city quay located near the intersection of Quay and Westgate streets. With the increased industrialisation of the Taff and Rhondda valleys and the building of canals and later railways linking them with Cardiff, the muddy flats south of the town offered new opportunities. 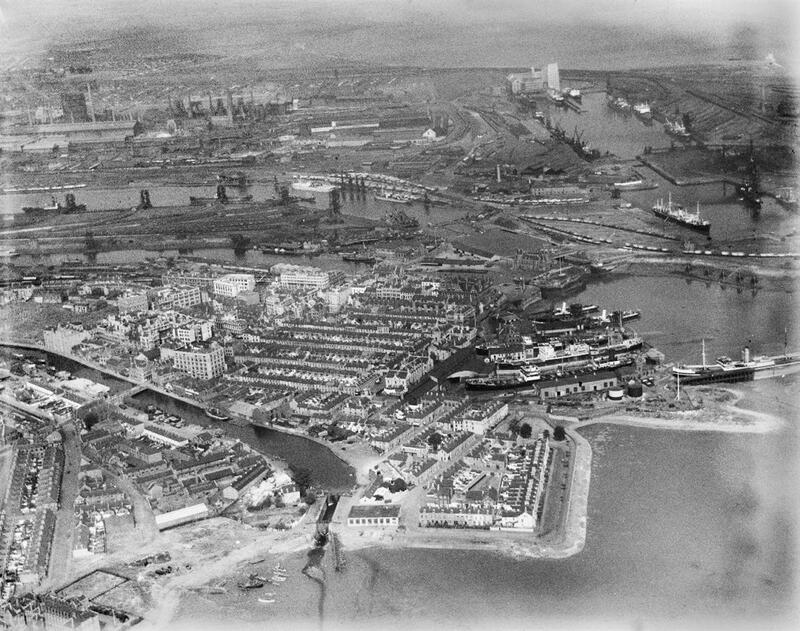 The Bute (West) Dock was opened in 1839, followed in the Bute East Dock in 1855–9, the Roath Dock in 1887, and the Queen Alexandra Dock in 1907. The Bute Dock Hotel, opened in 1839, still represents the last of its kind. Butetown was more than just an industrial area. The Bute Estate envisaged residential and commercial quarters alongside the docks and warehouses. Public houses sprung up, with the Bute Dock Hotel, opened the same year as the dock, still representing the last of its kind. Mount Stuart Square shows both the intention and evolution of the area. Built in 1858 by the Bute Estate as housing for skilled workers on the site of a glassworks, the square’s dwellings surrounded a green space. Examples of the original architecture can still be seen in numbers 6–9 on the eastern side and numbers 20–23 in the south-west corner. As Cardiff prospered those living in the square left for the suburbs and the houses were replaced from the 1880s by the richly-ornamented buildings and Coal Exchange still there today. 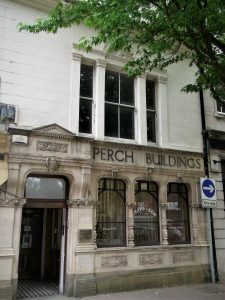 With its c.1858 upper storeys and 1889 ground floor, Perch Buildings shows the evolution of Mount Stuart Square. These late Victorian structures still stand as testaments to the wealth of Cardiff Bay. 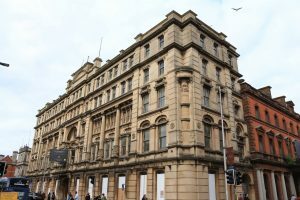 On Bute Street the ornate Midland Bank building was constructed in 1874 for the coal owners and exporters the Cory Brothers. A little over a decade later, the company moved its offices to new purpose-built premises: the Cory’s Building on the opposite corner! The Cory Brothers built Cory’s Building in 1889, moving from a building on the opposite corner. Unfortunately, buildings showing how the other half lived have largely been lost following widespread demolition of Tiger Bay’s humbler residential areas from the 1960s. They were not the only victim of the wrecking ball, however, as this constantly changing built landscape entered yet another period of drastic transformation which will be discussed in our next blogpost later this week. David Hilling, ‘Through Tiger Bay to Cardiff Bay – Changing Waterfront Environment’, Transaction of the Honourable Society of Cymmrodorion (1990), 173–191. Glamorgan Archives have written a number of excellent blogposts featuring many sites from throughout Cardiff Bay and wider Cardiff. Their website can be found here.